The 14th Great TV Show Idea Contest is looking for the next big television series--a story that puts a clever spin on the types of successful shows picked up by networks and digital platforms. All genres and formats accepted, including anthology or limited series. Accepted entries include loglines, synopses, show bibles, or video pitches. Completed pilot scripts are not reviewed, nor are entrants required to have a completed pilot. Every entrant receives brief feedback from a judge with remarks on the pitch's marketability and originality, sent after final judging is completed. For the winner, Script Pipeline provides additional, long-term assistance to refine the pitch, or help the writer draft a polished pilot or series outline. Our execs review the project and offer feedback at all stages of development. When the work is ready for circulation, we send the material to specific producers who would be a good match, including partners at Good Fear Film + Management (Mulan), Zero Gravity Management (Ozark), QC Entertainment (Get Out), Lakeshore Entertainment (Age of Adaline), and others looking for relevant, high-concept, marketable films. All writers retain the rights to their pitch, and development assistance for the winner is entirely optional. "Script Pipeline helped me develop my pilot, found me representation, and played a key role in getting a very ambitious TV project to some of the top producers, showrunners, and even networks. Their continual support and guidance has been invaluable--they are second to none." Since 1999, Script Pipeline has established relationships with hundreds of production companies, managers, and agents, resulting in $7 million in specs sold from previously undiscovered writers. The Great Movie and TV Show Idea Competitions aim to continue this successful process by working one-on-one with burgeoning writers to fine-tune their writing skills and push worthwhile stories into production. 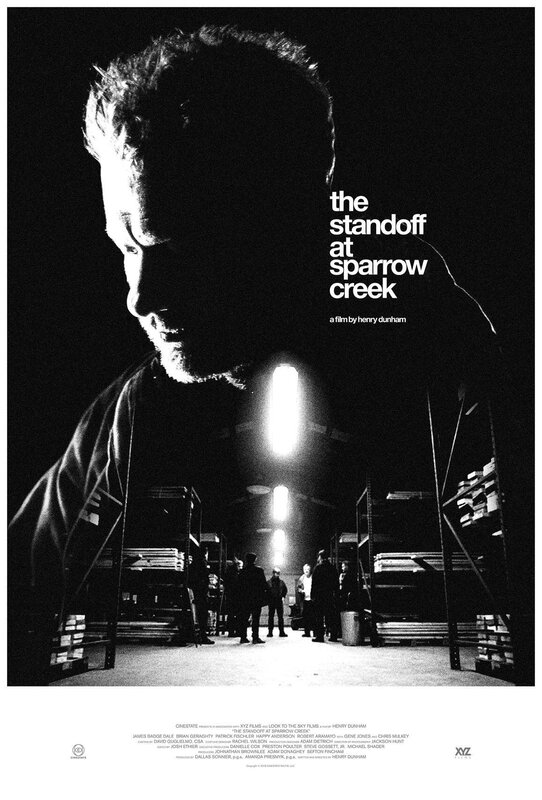 Submissions also accepted via. . . .
Henry Dunham's The Standoff at Sparrow Creek was produced with an ensemble cast featuring James Badge Dale (Rubicon), Brian Geraghty (The Hurt Locker), Happy Anderson (Mindhunter), Robert Armayo (Game of Thrones), and Gene Jones (The Hateful Eight). Dallas Sonnier, Jonathan Brownlee, and Amanda Presmyk served as producers. The film premiered at the 2018 Toronto International Film Festival, where it was acquired by RLJ Entertainment. It was released in January 2019. The project, originally titled Militia, won the 2015 Script Pipeline Screenwriting Competition. Writer Henry Dunham was connected with representation less than a month after contest results were announced, signing with Pipeline industry partner Madhouse Entertainment and UTA. "Without the momentum my win gave me, I don’t know where my screenplay would be. I owe Script Pipeline for everything." The script was a unanimous pick amongst Script Pipeline staff for top honors. Both CEO Chad Clough and Senior Executive Matt Joseph Misetich pegged the screenplay as a fresh, relevant spin on the genre, and an "unquestionably strong calling card" for the up-and-coming Dunham. "A pitch perfect example of low budget craft." - Birth. Movies. Death. And Rolling Stone selected Standoff as one of the top 10 films to see in January 2019. After introductions by Script Pipeline to management, Evan Daugherty sold Snow White & the Huntsman to Universal for $3 million. It marked one of the biggest studio spec sales of all-time and subsequently made Evan one of the most in-demand writers in the industry. The film grossed $400 million worldwide. "Immediately after the competition, Script Pipeline introduced me to a manager, and the connection helped launch my screenwriting career." Shortly after the Script Pipeline screenwriting contest, Evan landed an assignment with Warner Bros. to rewrite an adaptation of He-Man, which led to the sale of Snow White. Evan co-wrote an adaptation of the young adult novel Divergent for Summit Entertainment (Twilight). The film released March 2014 and stars Shailene Woodley (The Spectacular Now) and Academy Award-winner Kate Winslet. After selling a pilot pitch, it was later announced Evan would be one of the writers and executive producers on an adaptation of the DC comic franchise Midnight, Mass. for NBC and Five Ghosts for Syfy. He was one of the writers on Teenage Mutant Ninja Turtles, the Michael Bay reboot starring Megan Fox. Evan was tapped to write the event series Esmeralda for ABC Studios, and wrote an initial draft for Warner Bros./MGM's Tomb Raider reboot. Disney's Rose Red, based on an original script by Justin Merz and a pitch by Evan, will serve as a companion piece to the Snow White story. Vinson Films co-producing. The film is in development. Contest winner Tripper Clancy signed with a Script Pipeline partner following a top-four finish in the contest. A few months after the screenwriting competition ended, 20th Century Fox selected Tripper for their feature comedy writing team to help develop new material. "The impact Script Pipeline had on my writing career is extraordinary. Winning the contest directly led to my new representation, which in turn led to working with studios such as 20th Century Fox and Paramount." In September 2013, he sold the comedy The Ambassadors, and Tripper's buddy-comedy pitch Winter Break was picked up as the last spec sale of the year. In early 2014, he was hired to write the animated comedy Shedd for Paramount and, in 2016, the comedy Hacker Camp for Hasbro. Tripper's biggest script sale to date: Fox picked up his spec Stuber for the mid-six figures. The action-comedy is based on an idea developed by Tripper and his manager. Dave Bautista (Guardians of the Galaxy, Blade Runner 2049) co-stars alongside Kumail Nanjiani (The Big Sick, Silicon Valley), Mira Sorvino (Mighty Aphrodite), and Betty Gilpin (Glow). The film releases May 2019. In addition, his contest-winning script Henry the Second is being shepherded by Shawn Levy's 21 Laps (Stranger Things) and 3311 Productions. Tripper is also adapting the acclaimed novel The Art of Fielding by Chad Harbach, and is one of the writers on Amazon's High Five. The Script Pipeline contest-winning screenplay Shrapnel was turned into the film Killing Season, starring Robert De Niro and John Travolta. Corsan and Millennium Films helmed the action/thriller and rehashed the original plot during development. It was the first Script Pipeline winner to be produced. Octagon Entertainment signed Screenwriting Competition winners Joshua Johnson and Jamie Napoli (Getaway). Script Pipeline execs introduced Octagon manager Jeff Diamond to the writing team, who have another feature in development. Writers Burke Scurfield and Adam Lederer signed with manager Drew Shenfield at Mosaic in 2018. Their comedy pilot, Big Boy, was circulated by Script Pipeline to Mosaic execs after the script's top 10 placement in the Script Pipeline TV Writing Competition. Sara Monge signed with Josh Dove at IPG Management in August 2018, after receiving circulation by Pipeline execs. Her pilot SOS placed in the top 10 of the 2017 TV Writing season. Andy Tennant (Hitch, Sweet Home Alabama) set to direct the Script Pipeline finalist screenplay Everything's Gonna Be Okay, written by Jen Goldson. It will be Jen's third produced film after meeting execs at the Script Pipeline writer/industry event, joining the romcom Off the Menu, directed by Jay Silverman and starring Santino Fontana (Crazy Ex-Girlfriend) and Dania Ramirez (Devious Maids), and the thriller Snatched, produced by Nasser Entertainment. Off the Menu released in 2018 and screened at the Toronto International Film Festival (TIFF). "I have been blown away by the amount of work Script Pipeline has put into getting my script out there. The best part: they're interested in you as a writer. From reading and circulating additional material to developing new concepts with you, the Script Pipeline team are wonderful partners-in-crime, and I count myself lucky to have them by my side." Searching, written by Sev Ohanian and Aneesh Chaganty (winners of the First Look Project), was selected for the 2018 Sundance Festival--and soon after picked up by Sony for $5 million. Sev previously co-produced The Intervention and Fruitvale Station.The film is Aneesh’s feature directorial debut and released in August 2018. Kevin Jones, winner of the Great TV Show Idea Competition and a three-time Script Pipeline Screenwriting Competition finalist, signed with management after extensive development with Script Pipeline's senior execs, who helped turn his contest-winning pitch into a pilot script. The project was shopped to major networks, which secured numerous meetings for Kevin. Howard Jordan (Family Be Like), runner-up in the TV Writing Competition, signed with Madhouse Entertainment and Paradigm. He wrote for the CBS sitcom Superior Donuts until 2018 and continues a career in TV writing. "When I relocated from NYC to LA to pursue sitcom writing, everyone I met in the industry said it wasn’t about entering competitions, it was about entering the right competition. Script Pipeline was a turning point." Chrissy Metz (This is Us) to star in Will O Wisp, written by Script Pipeline Screenwriting Contest finalist Evan Cooper. Evan previously placed in the competition with the thriller Ballerina Girl. He’s repped by manager Kailey Marsh and UTA. Director Scott Speer (Midnight Sun) is set to helm Script Pipeline finalist and "Recommend" writer Greg Wayne's dark romcom S21. Catapult and Needle's Eye producing. TV Writing Competition Runner-up Laura Bensick (The Mother) signed with UTA less than a few weeks after placing in the contest. The series is being considered by top studios and production companies. The Devil in Evelyn, winner of the First Look Project (Teleplay), was picked up for development by Mandalay Entertainment. Script Pipeline set up the writers, brothers Ben and Tyler Soper, with meetings after extensive circulation to Pipeline's industry network. First Look Project contest winner Besa is in development with Louis Mandylor (My Big Fat Greek Wedding) directing. Written by Michael Miceli, the crime/thriller won the Adaptation category of the inaugural First Look season and was later optioned. "From our first phone call, Script Pipeline became our personal champions and proceeded to surprise us again and again with the extent of their support. Thanks to them, we had meetings with a manager and production companies and are now developing our pilot with Mandalay Entertainment. Entering this contest was the smartest thing we did!" Screenwriting Contest finalist Max Martini directed his feature Will Gardner starring Martini in the lead role alongside an all-star cast including Elisabeth Röhm (American Hustle), Lily Rabe (American Horror Story), Dermot Mulroney (August: Osage County), and Gary Sinise (CSI: NY). Martini's company, Mona Vista Productions, donated 30% of the film's profits to charity. Nir Paniry's Princesses to be produced by Grey Matter Productions and Pascal Pictures. Joachim Røenning (Pirates of the Caribbean: Dead Men Tell No Tales) directing. Nir placed second in the Script Pipeline contest with his action screenplay The Coyote. TV Writing Competition finalist Dani Messerschmidt (Hello, I Live Here) signed with John Zaozirny at Bellevue Productions. Dani was introduced to reps from Bellevue at a Script Pipeline writer/industry event months prior. She's developing material for both film and TV. "In the few days after the competition announcement, we had a slew of terrific meetings. . . . Script Pipeline was a gift from the gods: it allowed us, two unknowns from Australia, to come to LA, meet people in the industry, and begin relationships." First Look Project contest winner Kristi Hall is developing a feature script with Kersey Management. Script Pipeline execs worked with Kristi for over a year on a high-concept action/comedy screenplay before sending it to manager Andrew Kersey. Screenwriting Contest finalist Charles Stulck signed with manager Andrew Kersey, a mere two weeks after introductions by Script Pipeline. Charles placed in the top 10 with his horror/comedy Cult-de-Sac. Six years after winning the Screenwriting Competition, Debbie Chesebro and Tyson FitzGerald optioned their screenplay Prom Queen to Classy Films as a result of Script Pipeline's long-term facilitation. "Being a finalist has given me exposure to high-profile managers/producers that I could never reach directly on my own. I'm still blown away where my script has been requested. And I really appreciate that they don't simply blast the industry in a 'one and done' manner. . . makes all the difference--you realize they care about and respect the writers." Android, written by Script Pipeline "Recommend" Matt O’Reilly, attached Aaron Paul (Breaking Bad, The Path). Olga Kurylenko (Quantum of Solace) also set to co-star in the sci-fi/thriller. Niall Johnson (White Noise) directing, with Infinite Studios and Picture Films producing. Screenwriting winner Tyler Burton Smith (Henchman) signed with WME and Grandview. He's written the reboot for Child's Play and has multiple film and TV projects in development. Screenwriting finalist Andrew Martin Robinson (Cut Its Head Off) signed with Peter Katz of Story Driven less than a week after his horror screenplay was circulated to Script Pipeline's industry network. Greg Martin and Eric Beu signed with Good Fear Film + Management (formerly Benderspink) in 2015. The writing duo were named the winners of the TV Writing Competition with their original pilot Beachwood. "We knew right off the bat that Jeff Diamond (Octagon Entertainment) was going to be an ideal match for us. We’re looking forward to developing our partnership and would never have met them were it not for Script Pipeline." Screenwriting Finalist Craig Weeden and veteran comic writer/inker Jimmy Palmiotti (Ultimate Spider-man, Jonah Hex) optioned an adaptation of Painkiller Jane to Solipsist Films (Sin City: A Dame to Kill For). The project is in development. Precious Cargo, a finalist in the Script Pipeline Screenwriting Competition written by Max Adams, released in April 2016. The film starred Bruce Willis, Mark-Paul Gosselaar, and Claire Forlani. Script Pipeline "Recommend" Micah Barnett sold Ricochet, a one-hour drama, to NBC a few years after finding management through a Script Pipeline industry contact. The Living Wake, Script Pipeline's first produced film, starring Academy Award nominee Jesse Eisenberg (The Social Network) and comedian Mike O'Connell, was released theatrically in 2010, eliciting from Variety: "A stunning feature debut. . . . Eisenberg is note-perfect. Supporting ensemble couldn’t be more colorful." Brian Watanabe's "Recommend" script Operation Endgame was produced with Zach Galifianakis (The Hangover), Adam Scott, Ellen Barkin, Ving Rhames, Maggie Q, Bob Odenkirk (Better Call Saul), and an ensemble cast. Script Pipeline CEO and producer Chad Clough brought the screenplay to Sean McKittrick (Get out, Us) at Darko Entertainment. Screenwriter Rob Nelms was hired to pen the script Between after introductions to a director by Pipeline's Chad Clough. The film premiered at Sundance and later aired on Lifetime. Script Pipeline Screenwriting Contest winner Slammin' by Aaron Metchik and Joseph Garner sold to Warner Bros. for six-figures in 2003. It was the competition's first major success story, and the first Script Pipeline writer to sell a spec for over six-figures. "No one has done more for our screenplay and our writing career than Script Pipeline. They've worked tirelessly in connecting us to industry professionals over the course of six years, ultimately resulting in our script getting optioned." Over the course of 20 years, many other writers have optioned their work, found paid writing jobs, produced their films, and garnered management or agency representation through Script Pipeline's exhaustive process of industry facilitation for top screenplays and pilots. Script Pipeline's criteria is based primarily on the overall originality marketability of the concept, preferably hitting a "Goldilocks zone" between commercial/mainstream and something wholly new and artistic. Although we're extremely strict on judging, all types of genres, styles, and premises are accepted (must be for a scripted series, not reality or game show). In the past, selected ideas have ranged from character-driven dramatic series, to sitcoms and animation, true stories, and hourlong dramas. Anything unique and universally appealing is fair game. For execs interested in reviewing Script Pipeline competition winners, email us or complete the industry request form here. We will only consider applicants who are active producers, agents, managers, or directors. Note: Pitches for reality TV and game shows are no longer accepted. Must be for a scripted series. A two-sentence logline to a full treatment--entirely up to you on how to best present your idea. We do not judge on format, we judge on the idea itself. Supplemental materials (illustrations, etc.) are also allowed. The best format is usually comprised of a logline, half-page to a page-long summary, and any other notes or comments on the originality of the premise. Please do not send full-length screenplays--summaries ONLY. Pitches may be emailed direct or uploaded. Remove your name and contact information from the documents prior to submitting. Longer submissions are judged on the same criteria as short ones, so whatever length you think is best. Videos can be any length, but shorter is typically better. Concept must be for a scripted television series. Script Pipeline will not share your idea with anyone unless you’re chosen as a finalist and give us explicit permission to do so. Previous Script Pipeline writers and former Great Movie Idea contest entrants are welcome to submit, but material must not have been previously entered. Goes without saying, but the concept needs to be WHOLLY ORIGINAL and not based on an existing franchise. WHAT ARE THE DEADLINE DATES AND ENTRY FEES? IS MY IDEA PROTECTED? WILL I RETAIN THE RIGHTS TO THE IDEA? All rights remain with the writer, regardless of the contest results, and no one outside of Script Pipeline's team of judges will review your entry without the writer's permission. For the winner, we will not send out their winning idea until we have their consent and mutually deem the project "circulation ready." Yes, ALL entrants receive brief, general feedback (appx. a short paragraph in length) on their pitch, specifically covering our thoughts on marketability and originality. Feedback is sent after final judging is completed. For longer, more in-depth feedback, entrants may receive an exclusive discounted rate on Treatment / Pitch Notes that cover everything from plot and concept to marketability and character. A sample can be found here. These additional notes are optional and kept separate from the judging process, meaning you'll have a different reader during judging. Yes, absolutely. Anyone worldwide can enter. We'll accept anything from a logline (as brief as a sentence) all the way up to a full treatment with supplemental materials. We'll also review video pitches through a private link or as an attached file. Whatever format you prefer that best exemplifies your idea. Also remove your name and contact information from the materials prior to submitting. WILL I BE DISQUALIFIED FOR A FORMATTING REASON? No. If for some reason we can't open the file, or link, or there's an issue with the entry itself, we'll contact you immediately, and you'll be able to re-send. DO YOU ACCEPT LOGLINES ONLY? That being said, loglines work best for stories that are truly high-concept, and smaller character studies would probably benefit from a longer synopsis. CAN I INCLUDE MY NAME ON THE TITLE OR COVER PAGE? For entrants whose pitch documents have a cover page, please exclude your name and email. Should only be title of the project. IF I WIN, DO I NEED THE COMPLETED PILOT SCRIPT? Not at all. If you do, great, but it won't affect the outcome of the contest. We're just looking for original, unique concepts. No TV writing experience necessary. Our development team will assist in refining the pitch and helping you get started on the pilot script itself. CAN I SUBMIT MORE THAN ONE IDEA FOR THE SINGLE FEE? There is no limit to the number of entries. Each idea, however, is a separate entry fee. WHAT IF THE IDEA IS FROM MY EXISTING SCRIPT OR NOVEL? AM I STILL ELIGIBLE? Yes, as long as the idea is original (i.e. your own creation), or you've retained the film adaptation rights to a property that isn't yours. Email our contest coordinator with any other questions. You can upload your submission material below, or email it to entry@scriptpipeline.com after you’ve completed your order. If you’re submitting a logline only, you may enter it into the space above without sending additional files. Please confirm that you have read the Great TV Show Idea Contest terms and conditions.